Enterprise-wide data replication improves availability, performance, fault-tolerance and dependability of database services within and between different subunits in medium and large enterprises. The overhead of consistency management of replicated data can be tamed by built-in DBMS functionality. Different kinds of applications, e.g., update-intensive online transaction processing, cyclical updates for data warehousing, knowledge sharing of repository data, and so on, have different requirements for the availability, up-to-dateness and consistency of replicated data. 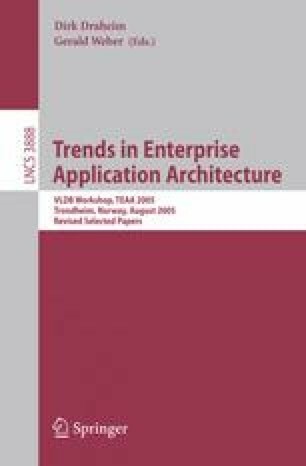 Thus, replication strategies should be adaptable to the specific requirements of diverse enterprise applications. We describe a middleware for enterprise-wide data replication. It maintains meta data for several protocols, so that the replication strategy can be adapted on the fly to the actual needs of an application. We acknowledge the support by the Spanish MCyT grant TIC2003-09420-C02 and the EU grant FP6-2003-IST-2-004152.